News from the preserves, parks and backyards of Princeton, NJ. The website aims to acquaint Princetonians with our shared natural heritage and the benefits of restoring native diversity and beauty to the many preserved lands in and around Princeton. Googling myself, I found some published writings from my days in Durham, NC, where I founded a nonprofit called the Ellerbe Creek Watershed Association. Published in the "Front Porch" section of a news magazine called Indyweek, they make a good entry for this website's 1250th post. Though the reservoirs that feed Durham's faucets--Lake Mickie and the Little River Reservoir--are still low, I am happy to report that Lake Hiltner is now filled to the brim, thanks to recent heavy rains. Located on an upland slope in an old city neighborhood, it receives its waters from a nearby mountain range, better known as my roof. Lake Hiltner is what my next door neighbor calls this new, homemade body of water, but at 8 feet across, terracing down to 2 feet deep, it's somewhere between a pond and a permanent puddle. A pondle, perhaps, or a pund. It needs a good name, because it's such a satisfying thing to have in a backyard garden. In time, frogs will move in, and hummingbirds will find the hibiscus, cardinal flower and jewelweed that bloom along its shores. Most of all, the mini-pond is responsive to the weather and the seasons, slowly diminishing in drought, rising in the rain. Flowers come and go in succeeding waves; the school of mosquito fish--a native of local creeks related to guppies--swells with each new batch of fry. And then there are the distinguished visitors, which in other backyard mini-ponds have included great blue herons and hawks. For those who seek larger meanings in backyard projects, a neighborhood dotted with Lake Smiths and Joneses will be better prepared for extremes of weather. Drought and flood teach the same lesson: Find a place for rainwater in the landscape. The current practice of shedding runoff quickly from roofs into streets into urban creeks not only creates destructive flooding, but also leaves the rainwater-deprived landscape more vulnerable to drought. The most drought-resistant landscapes are those where water is allowed to linger, whether in mini-ponds or in absorbent swales where water will seep in over a few days. Water allowed to seep into the ground creates an underground reservoir of moisture for plants to draw on during drought. This has been clearly demonstrated this summer as larger-scale projects like the stormwater wetland at Hillandale Golf Course and the wetland gardens at Indian Trail Park continue to flourish without watering. The same philosophy applies to the backyard. The way to reduce weather's extremes is to accept the gifts currently spurned. It involves harvesting the rain that falls on house and yard, in rainbarrels, raingardens, grassy swales, mini-ponds and soil made absorbent by mulch. Even the condensate from air conditioners, most abundant when it's most needed, can be directed to a pond or raingarden rather than left to soak into the foundation. Though droughts and torrential downpours teach harsh lessons, the response can be a rewarding adventure. It's fun to watch 6-year-olds deal with the concept of spring starting on a particular day. They think something magical is going to happen--all the flowers will burst forth, the temperature will suddenly jump. But the heavens and the trees don't give a hoot about March 20th, the official start date for spring, and kids everywhere are left to wonder what it's all about. By coincidence, March 20 was the day I went to my daughter's first grade class to do a little planting project. The bushes we were going to plant had no leaves and no roots, but I assured the students that they would grow. That would have to be magic enough to fill the gap between this most ordinary day and the far grander work of their imaginations. The activity is by now pretty standard. A couple of big plastic tubs--the cut off ends of a donated 55 gallon drum--stand ready outside the classroom. After some discussion about the things plants need to grow, the kids do their best to shovel schoolyard dirt into the tubs. When they're filled to the brim, we add water to turn the dirt into glorious mud. Finally, each kid takes a freshly cut section of stem from one or another native shrub that grows along Ellerbe Creek in Durham--silky dogwood, buttonbush, elderberry--and sticks it deep into the ooze. This time, though, about when we had 20 stems in each tub, the kids began singing "Happy Birthday." Now the grown-ups were left wondering. In the eyes of the first graders, the tubs of brown mud with sticks pointing up had taken on the look of birthday cakes with chocolate frosting and candles. "Happy birthday, silky dogwood. Happy birthday to you." In a week or two, the buds on the sticks will open, and the buried portions will sprout roots in the mud. By fall, Forest View Elementary will have 40 shrubs to plant on the school grounds. But more importantly, the kids got to dig the good earth, to learn which way's up on a buttonbush sprig and, best of all, they found meaning in the day. A birthday for spring--maybe that's what March 20 is really all about. The narrow leaves of willow oak spin earthwards, catching flashes of morning light. In walks along the tree-lined canyons of city streets, we are all victors in a ticket-tape parade. The sun's rays, having lost their summer harshness, now angle into the sheltered air beneath trees, illuminating the languid descent of leaves from the vaulted canopy. Not all leaves are so elegant. Pine needles plunge earthward like clouds of arrows. The broader leaves of maples fall in rocking zigzags. But willow oak leaves are designed to celebrate their momentary freedom in one long graceful pirouette. They spend summer clustered overhead, anonymous in dense masses of green. Then they become a million individualists in their first and last dance back to earth. In loose embrace with gravity, they fall--each spinning in its own manner, at its own tempo, each captured for a moment by the sun's beaming light. Having reached the ground, again anonymously massed, they mingle and merge and return by degrees to the soil from which they came. Is it me, or the month of August, when stagnant, humid air seems to seep into the soul? Yes, for those who stick it out and remain in town through August, there are glorious flowers and a few things done that needed doing, but still the month is like a remembered dream in which the desire to run, run, quickly, is foiled by legs too heavy to move. I look at these slow-growing shrubs along Hamilton Ave, buried beneath a sea of bindweed that, as relentless as time in its ambition has begun to engulf the house as well, and know the feeling. Looking out on this wetland, you would understandably think you aren't in Princeton anymore. But this broad and beautiful marsh, the centerpiece of Rogers Refuge, is just a short drive upstream from Alexander St, off West Drive. The Friends of Rogers Refuge (FOHR), which has been quietly caring for this renowned bird sanctuary, turns 50 this year. Comprised mostly of devoted birders, the Friends group grew out of actions by the Princeton Environmental Commission in 1968 to halt filling of the marsh. A prominent ornithologist named Charles H. Rogers was among those who led the campaign. A conservation easement renewed every ten years has helped to protect the wetland since, but no habitat is protected by a paper agreement alone. Though auspiciously located in the floodplain, between the Stonybrook and the Institute Woods, the habitat benefits from a collaborative effort of the landowner (NJ American Water) the town of Princeton, and the Friends group. For instance, though the wetland receives runoff and groundwater seepage from the Institute Woods, and occasional floodwater from the Stonybrook, the habitat benefits from a steady input of water pumped from the river during the summer months. The water company pays for the electricity to run the pump, the town helps with repairs, and the Friends keep an eye out to respond quickly to any breakdowns. 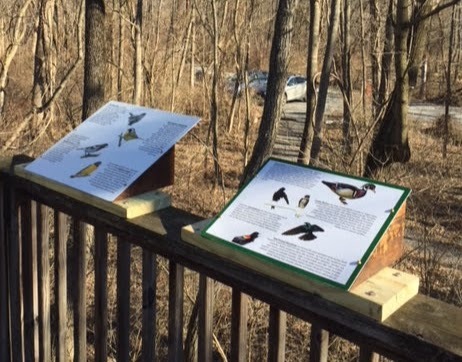 The Washington Crossing Audubon Society not only leads walks there during bird migration in May, but has also funded much of the Friends' efforts to restore habitat and build observation towers. They also funded an ecological assessment and stewardship plan I did for the Friends in 2006. Talk to members of the group and they will tell you excitedly about the kinds of birds they see at the Refuge. Since birds require habitat, much of the group's active stewardship centers around controlling invasive species. Though the native cattails can be a little aggressive, its the nonnative Phragmitis that poses the greatest threat to a balance of plant life in the marsh. In this photo, the cattails show as dark green, with wild rice appearing as light green in the distance. In the foreground and to the left is the browned remains of Phragmitis reed, killed with low-toxicity, wetland-safe herbicide. When a similar treatment was applied 12 years ago, the void left by the Phragmitis was quickly filled with a great diversity of native wetland species. The same can be expected this time. Hopefully, another such large scale treatment will not be necessary if there's sufficient followup to prevent the few remnants of Phragmitis from rebounding. It's human nature to shift attention elsewhere when a threat has been greatly diminished, but when dealing with invasive species, that's when vigilance is most needed. Another example is chocolate vine, which I discovered growing next to the small parking area at Rogers Refuge. This is the only location in Princeton where I've encountered chocolate vine, yet its behavior suggests it could quickly become a problem if left to grow. Its rapid expansion at Rogers Refuge, up trees and over bushes, should make any homeowner think twice about growing this nonnative species, lest the birds carry its seeds to a nearby nature preserve. Porcelainberry is another invasive plant that has shown up at the Refuge in recent years, and has quickly begun dominating woodland edges. A look behind the Clark House at the nearby Princeton Battlefield shows how dominating this vine can become if left unmanaged. Further evidence that a wildlife refuge doesn't take care of itself came a few years ago, when I discovered a third nonnative vine with highly invasive behavior, appropriately named Mile-a-Minute, growing along the driveway that leads to Rogers Refuge. A thorny annual with a distinctive triangular leaf, it too has proven extremely aggressive elsewhere in NJ. We've been fortunate to catch it early in Princeton, and respond quickly before it produces seed and spreads around town. Heavy browsing from deer has been a problem in past years, but the town's investment in deer culling, since 2000, has not only dramatically reduced car accidents in town but also greatly benefitted habitat at the Refuge and elsewhere. The birders report that the return of a healthy understory of spicebush, previously almost eliminated by the overcrowded deer, has brought back ovenbirds that depend on the shrubs for nesting habitat. "I am pleased to report that the informational signs at the Refuge, ripped from their frames on the main platform by vandals a year ago, have been restored. Many thanks to the hard work and generosity of Charles Magee, who remounted them with a more secure system. Visitors can again find pictures and descriptions of some of our most attractive birds close at hand. Thank you, Charles!" Leading the group in recent years has been Fred Spar (left), with particularly active support from his wife Winnie and Lee Varian (right). Fred reported to me that there was a particularly good spring bird migration this year, perhaps the best they've ever had, due in part to winds that shifted migration routes eastward. From the observation tower can be seen a purple martin house erected in the middle of the marsh by the Friends. It was alive with the comings and goings of the purple martins earlier this summer. If you stop by this hidden gem, wish a happy 50th to the group that through quiet persistence and dedication has kept Rogers Refuge well cared for. These are the glory days for monarch watching, with the backyard packed with flowers--a veritable feast that we are grateful to provide. Lovely as it is, the levitated landscape of pinks and yellows, reds and whites, gains a deeper meaning when a monarch arrives to animate the garden with its fanciful, danciful flight. Brilliance of color is matched by brilliance of movement, with glides and hairpin turns, sudden dips or dartings upward, gracing a garden's contours as if its flight were a form of affection. With an uncanny mix of power and whimsy, the monarch looks to know what it's looking for, as it approaches then darts away or doubles back, each minute of its flight a hundred instant decisions. What makes it land on one flower after approaching and rejecting so many others, seemingly the same, is a mystery. This morning we saw four at once, two of which flew together, then collapsed upon the carport roof, there to mate for a minute while I ran to grab my camera. The one in front looks to be the female, with thicker veins and no little black spot on the wing. and those little black spots on either side of its abdomen. The monarchs were especially drawn to the joe-pye-weed that with the summer's heat and rain have grown to ten feet high, like a mountain range of flowers. like this butterflyweed that is flourishing in a neighbor's garden. Most of Princeton's milkweed is common milkweed, which is less ornamental, spreads underground, and can be found in fields, along roadsides, and in this case growing at the nearby Princeton High School ecolab wetland. Other species include purple milkweed, a few of which grow at Herrontown Woods, and green milkweed, found years back in the meadows at Tusculum. The dominant ideology of our day has deprived us of the satisfaction of contributing to something beyond ourselves. I grow more garden and less lawn because I love native plants, but the monarchs connect the garden to something much larger. Each March, starting out from their wintering home on just a few acres in the mountain forests of Mexico, the monarchs stretch themselves across all of eastern North America, ambassadors of beauty, as if to tell us that all our small efforts, spread across the land, are additive in and to nature, that we can contribute to something profound. May the monarch teach us how to find that satisfaction in other aspects of our lives as well. These aren't just goats. These are goats for good. As an eastcoast naturalist dropped down onto a windswept trail overlooking the Pacific Ocean at Half Moon Bay, I immediately began speculating about what goats were doing here in this parched coastal prairie. What's to eat in this land where no rain comes all summer. Days are warm, nights are cool, the sun shines, with little variation beyond that. I'd seen goat herds munching on kudzu and other invasive plants in North Carolina, and read that they're used to clear powerline right of ways in the northeast, so it's not a stretch to guess that they are assisting in habitat restoration here along the coast south of San Francisco. Fortunately, I have a friend in the habitat restoration business in California, Bruce Berlin, who could confirm my hunches, and also identify the plants I saw them eating (photos and names below). I know Bruce through his son Kyle, who was valedictorian at Princeton University this year. Kyle's speech is a beautiful thing, special in all kinds of good ways. But back to the subject at hand, or foot. While most of the native plants are dormant during the summer dry season, introduced species like this jointed charlock are still green, making it possible to direct the goats' appetites towards eating the nonnatives. People help too, organized by the Coastal Land Trust, but I'm guessing the goats they hire eat more invasives than any human herd could pull out. "Goats for good" was a resonant phrase that popped into my head, but it turns out there is a real Goats for Good--a nonprofit that is making a better world, with goats. In fact, it's tempting to expand the goodness goats could do by organizing goat herders to descend upon Washington, D.C., for a Million Goat Munch. They'll gather on the mall for inspiring speeches, then be let loose in the hallways and offices of Congress, the White House and the Supreme Court, to consume all the papers filled with nonsense generated by people blinded by anti-government fervor. It will be great, unless the goats also eat the Declaration of Independence, the Constitution, and whatever other useful documents still remain. Getting goats to be selective has always been a problem. Goats are most useful in highly degraded landscapes, which is probably what triggered the Million Goat Munch idea. Though trees serve as windbreaks in the San Francisco area, historically the land was home to coastal scrub habitat that has become rare and requires work to bring back. Habitat restoration is the means by which recovery can happen, but even this seemingly benign, uncontroversial activity has sometimes come under attack, most stridently in the San Francisco area, where lovers of the (Australian) eucalyptus have risen up in outrage when the trees get felled to help bring back the native flora. And the nonnative ice plant, shown here coating the cliff in monoculture fashion, can be attractive, particularly when in flower. It's an attractive tyranny, though, if viewed from the perspective of any other plant that might otherwise be able to grow there. "Glad you are enjoying the Coast of California. Yes- many of the CA natives go dormant during our Summertime- though not all. Yes- you are correct- most all of the plants you sent me are invasive non-natives that are opportunistic and problematic. Yes- also- Goats and sheep have both been being used more and more to do weed control- and more often fire vegetation management in areas that are steep and inaccessible. Those weedy grazing animals are also being used around ground mounted solar farms- but there they prefer the sheep, because goats have a tendency to hop up on the low- mounted Solar arrays ! Here is the website I use to dial in on what plants historically occur there." The Calflora website he mentioned looks to be an incredible resource for learning about and working with the plants of California. Only one of the eight plants I photographed turned out to be native. This is typical of locations that were intensely farmed, then preserved. Weeds fill the void after farming stops. There may be some native plants mixed in, but they are likely as brown this time of year as the grass, awaiting winter rains to begin growing again. Two of the plants--curly dock and bird's foot trefoil--are also common weeds in NJ. Parting idea before the plant photos: Before releasing the goats into the habitat, rub native seeds into their fur so the seeds will slowly fall out and hopefully get planted "underhoof" as the goats walk the property. Or scatter native seed in the area before letting the goats in, so they will stomp them into the ground with their hooves. Thanks to Bruce for IDs on these plants. There's a magnificent black oak growing, growing, growing in an unlikely place along Princeton Pike. Like the Mercer Oak, Jr. just up the road at the Princeton Battlefield, this oak too is of such distinction that it has its own corral. Driving by recently, I couldn't resist pulling over into the new Bristol-Myers Squibb parking lot and walking down to take a closer look at how it's doing. This champion tree--so-called because it's by far the largest in the state--is thriving, standing like royalty, master of its domain, with full access to sunlight all around and the soil all below. The crown overflows its 100 foot diameter corral. Each of its millions of leaves is glossy and beautifully sculpted, the acorns small, as if this giant tree were compensating for the lone osage orange tree up the way about half a mile, barely a quarter of the black oak's height but with softball-sized fruits. 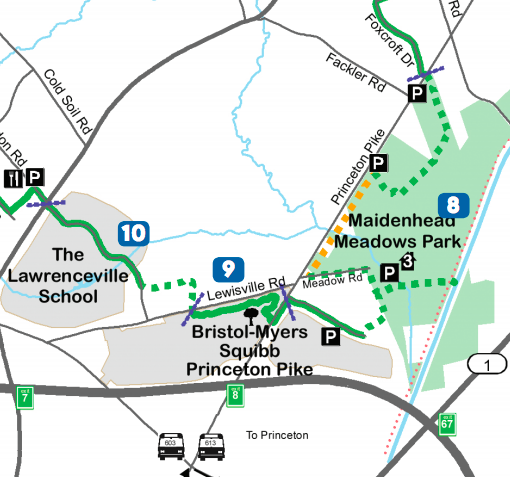 You can see the location of the Brearley Oak marked on this map, just above the hyphen in Bristol-Myers Squibb, close to Princeton Pike. The tree stands at the southernmost point in the Lawrenceville Hopewell Trail--a trail large enough to have its own nonprofit and website. Nearby, to the east and north, is Brearley House and a park named after a great meadow from colonial and Indian times, and which the oak may have been witness to. That meadow was likely natural in part, but also managed at first by American Indians, who tended to burn the landscape, the better to attract game with the nutrient-rich growth that sprouted in the fire's aftermath. There was a time when an oak this massive, with 20+ foot circumference, and perhaps 80 feet tall, would have been the rule, not the exception, when much of America was managed by American Indians, with the help of fire. The oaks have fire resistant bark and decay-resistant leaves adapted to remain on the ground as fuel. Then, when a low, mild fire started by lightning or people comes along, the leaves carry the fire across the ground, which in turn kills the oak's thin-barked competitors but not the oak. The red dots on the map below, from Charles Mann's 1491, indicate areas managed by American Indians with fire. There are lots of dots shown in what is now NJ. In colonial and pre-colonial times, an oak like this would have had a rich understory of wildflowers and grasses, adapted to the ever shifting patterns of sun and shade. One of the limbs is so long that it's supported by a post. And a lightning rod is attached on either side. I'd love to go there sometime with a group of people. We'd recline on lawnchairs and gaze upward, tracing with our eyes the limbs' ascent towards the sky. A tree is like a city, with thoroughfares and sidestreets and cul de sacs of leaves. It is a solid built of air, some of which it breathed in before we were a nation. Ignoring busy Princeton Pike and the sterile corporate lawns that surround it, this black oak soaks up the sun, drinks deeply from below, dreaming green dreams of mighty landscapes past. Judging from the corn fields around Princeton, the old adage "knee-high by the 4th of July" needs to be updated. Corn was at least head-high earlier in the month. The rhythm and rhyme can be applied to the classic mid-summer flowers of Princeton's floodplains, whether along the canal towpath or planted ten years ago on the higher ground at the Princeton High School ecolab wetland: JoePye by the End of July. That's Joe Pye Weed, which comes in several species, the most common around here seeming to be hollow-stemmed (not in the photo). That's rose mallow hibiscus in the background of the first photo, thriving with its feet in water consistently supplied by the school's sump pump. Wild senna is another classic mid-summer native flower, in the pea family. Planted in this case at the new botanical garden at Herrontown Woods, it has yet to be browsed by the deer. The white spires in the background are Culver's Root, a purchased native that I have yet to encounter growing naturally in NJ. Another common mid-summer classic is cutleaf coneflower, not shown here, but popping out at the various places we've planted them in town.